My long time friend and colleague, the legendary A. Ernest Fitzgerald (AF bio), passed away a few days ago at the age of 92 after a long illness. Being around people like Ernie Fitzgerald was one of the main reasons I loved working in the Pentagon. Most people working in the Department of Defense go along to get along; and while a majority (certainly not all) are patriotic, intelligent, and hard working … they are also boring. But there is something about military institutions that attracts a very few fun-loving, brilliant mavericks who love to throw rocks at the institutional boat, particularly when it is in the interest of committing truth and doing what they believe to be right in the face of incompetence or corruption or both — and all institutions that spend other people’s money, like the DoD, are prone to both incompetence and corruption. These mavericks have the same virtues as the majority — but they are definitely not boring, and they possess something else: an inner drive that is very rare. Their numbers are few, because military institutions hate them, view them as being certifiably crazy, and go overboard to expel them. On the other hand, these institutions need their “crazies” to stay healthy and vibrant. The late Ernie Fitzgerald was one of the most precious of the “crazies” — and he beat the expulsion game in a truly amazing way. I first heard about Fitzgerald at the very beginning of my career in November 1968, when he testified — or in his words, “Committed truth” — to Senator Proxmire’s Joint Economics Committee on the huge cost overrun on the C-5A transport. At that time I was a 2nd Lt buried in the Flight Dynamics Laboratory at Wright-Patterson AFB, and congressional hearings were distant abstract affairs. But the newspaper reports of his testimony were electrifying. Moreover, they struck home; I had been hearing horror stories about the C-5, particularly its landing gear, for almost a year from one of my closest friends, also a 2nd Lt, who worked in the C-5 program office, which was just down the street from my office. My reaction was — Thank God, at least someone in DC has their head screwed on and is finally telling the truth about this piece of crap! Ernie immediately became a hero to both my friend and me. I finally met Ernie 10 years later, when I was a civilian working in the Pentagon. Ernie had been fired by the Air Force, but the expulsion failed spectacularly. 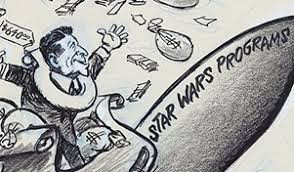 The AF was forced to rehire him, together with back pay, via a law suit that made it all the way to the Supreme Court together with some reckless statements about firing him by President Nixon that were discovered on the Watergate tapes. 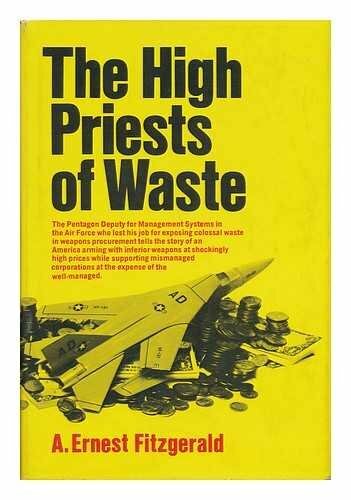 Ernie had become world famous, not least because, in his spare time, he also penned the High Priests of Waste, a best selling book about his adventures in the Pentagon and the underlying causes of cost overruns. This book is now a classic, because Ernie was much more than a whistle blower; he was a brilliant industrial engineer who understood the pathological nature of manufacturing and contracting in the Military-Industrial-Congressional Complex. His timeless book should be mandatory reading still for anyone involved in the design and purchasing of weapons by the DoD. Despite his fame, Ernie was in not in the least bit pretentious. Quite the contrary, his twinkling eyes, infectious smile, and his deep Alabama accent were accompanied by a wonderful sense of humor that would have everyone (except the generals) rolling in the aisles with laughter. We became fast friends over the following years. 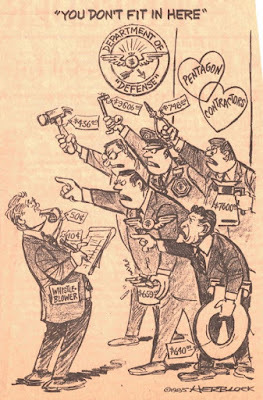 The great Washington Post cartoonist, Herblock, was one of the very few observers who instinctively understood Ernie’s game plan, and he did some of his best work highlighting the connection between Steps I and 2. That Step 2 of Ernie’s strategy did not play out as he hoped is no reflection on him. 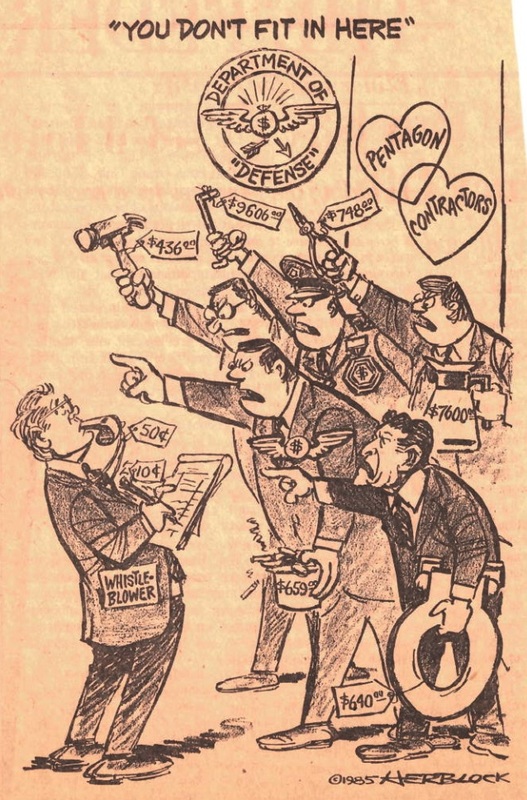 With a few exceptions, like Herblock, Step 2 was a mental 'bridge too far' for the crass publicity seeking predilections of the press-politician lash-up in the contemporary American Deep State. Long-time defense reporter Mark Thompson has written a great tribute to Ernie's career that can viewed at this link. Ernie was a great friend and an exemplar to anyone aspiring to a career in the Department of Defense. I shall miss him.